Will Montague has represented businesses and individuals in a variety of industries for over twenty-five years, providing legal advice on a wide range of intellectual property and technology law matters. At the end of 2010 he left one of the region’s largest law firms and opened his own solo law practice in a local tech hub. Will continues today to work in the same vibrant entrepreneurial space surrounded by software developers, video game creators, and other creative individuals, experiencing the same risks and rewards as the entrepreneurs and other business owners he represents. He also is able to provide the benefit of years of sophisticated, large firm experience at more flexible and reasonable fees. Select any of the following links to learn more about Will’s experience in intellectual property litigation, business litigation, and contracts and transactions. 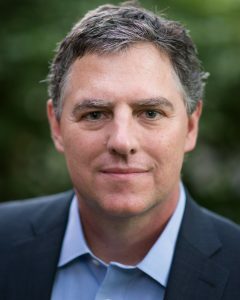 Will graduated from Vanderbilt University in 1988 and from the University of Kentucky College of Law in 1992, where he was an associate editor of the Kentucky Law Journal. After law school, he spent a year in Virginia clerking for the Honorable Samuel G. Wilson, United States District Judge for the Western District of Virginia. Will then joined Stoll, Keenon & Park (now Stoll Keenon Ogden PLLC) as an associate. He became a partner in the firm, ultimately co-founding and chairing the firm’s seven-lawyer Intellectual Property & Technology Department. In 2005, Will left Stoll Keenon to join AmLaw 200 firm Dinsmore & Shohl LLP as a partner, continuing to practice intellectual property and computer/tech law. Will formed Montague Law PLLC at the beginning of 2011 to provide his clients with more personal and cost-effective legal counsel. 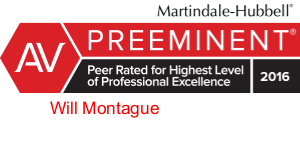 Martindale-Hubbell Peer Review Rating: 5.0 out of 5 (“AV® Preeminent“). AV® Preeminent is a certification mark of Reed Elsevier Properties Inc., used in accordance with the Martindale-Hubbell certification procedures, standards and policies.